By Purchasing these Drivers you agree to the above. The Twelve pack resistor set includes the resistors that will allow you to set the G-203V to any of the following Amp outputs for your motor. 1.0 amps, 1.5 amps, 2.0 amps, 2.5 amps, 3.0 amps, 3.5 amps, 4.0 amps, 4.5 amps, 5.0 amps, 5.5 amps, 6.0 amps, 6.5 amps and 7.0 amps per phase. This item comes with One Year factory warrantee. 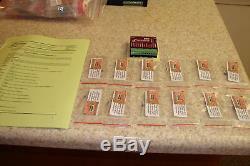 Save on a lot of two, or 3 lot or 4 lot in other listings in my store. You also receive a manual on CD. 7A 80VDC maximum power ratings. Optoisolated STEP, DIRECTION and DISABLE inputs. 2.5V, 3.3V and 5V logic compatible inputs. Recirculate mode while motor is stopped. 350 kHz maximum Step puls frequency. Power and error LED indicators. No user settable jumpers inside. Morphs to full step at higher speeds to maximize motor torque. Same size and terminal pin-out as the G201. Multiple item orders only, NOT on single item orders. Thanks for reading and be sure to Google Hubbard CNC to see our glowing reviews and other spectacular deals we have online! THE MESSAGE ABOVE ONLY APPLIES TO PEOPLE ORDERING MORE THAN ONE TYPE OF ITEM FROM OUR STORE! 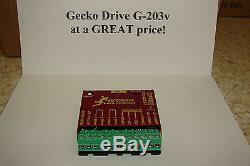 The item "CNC Geckodrive G-203V ONE YEAR FACTORY WARRANTY stepper motor Driver WithEXTRAS" is in sale since Sunday, January 29, 2012. This item is in the category "Business & Industrial\Automation, Motors & Drives\Drives & Starters\Drives & Motor Controls\Stepper Controls & Drives". The seller is "carolbrent" and is located in Sacramento, California. This item can be shipped worldwide.